Description: These poor souls were never married. Well, now they know they can fall back into love in the afterlife! Join them for their ghostly cute wedding day! Look at that adorable flower ghoul! 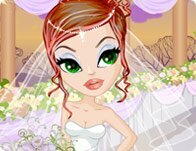 Instructions: Use your mouse to click on and through the floating hair, clothing, and accessory options for this ghostly groom and boo-tiful bride.